First posted August 11, 2004. A few years ago, I read several blog articles about the decline of marriage in the United States. The blogger suggested that the problem with marriage is that we are working too much for too little and that is the primary reason that marriages break up. 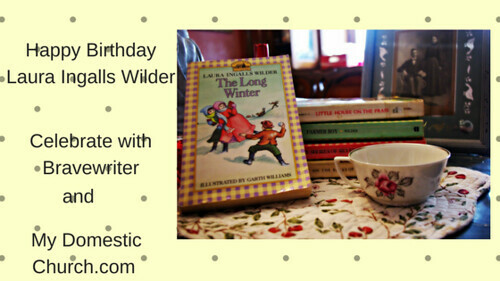 While the blogger continued to work out his plan for saving marriage (something about paid time off for just about everything) I couldn't help but think about the Laura Ingalls Wilder Little House Books. If you haven't read Mrs. Wilder's "Farmer Boy" I would suggest it as a nice winter read for children or adults. What struck me though about the story of Almanzo Wilder and his family was how much WORK they did all day long. For Mrs. Wilder, life was a continuous ongoing attempt to keep the family fed through a hearty breakfast, to a huge lunch and an even bigger dinner! In between times, of course, there was laundry, housework, mending etc., but the biggest part of her day was getting enough calories into the men so that they could sustain the hard work they were doing outside on the farm! There were no fast foods, frozen dinners, drive through at McDonald's. This was all from scratch, from the farm or the market, tasty, simple, home cooking. The men were busy taking care of livestock, planting, cultivating, sowing, repairing, day in and day out throughout the seasons regardless of the weather. At night they read a bit, but basically when the sun went down, so did the Wilders. It seems to me that they had less "quality" time together than the average American Worker, for certainly less pay and definitely more hard physical labor. Yet, THEIR marriages stayed together! Come to think of it, my own grandparents worked pretty hard too. My grandfather worked the farm at night, but during the day he worked on the assembly line for Chevrolet. My grandma did housework, farm work and even worked as a church secretary for a time. They were married until my grandmother's death after 52 years of marriage. I don't think the hard work, the low pay and the lack of "quality time" hurt their marriage and I'd venture to guess that since the divorce rate didn't start soaring until the 1960s, that there are other more primary factors that are tearing marriages apart nowadays. Maybe what we can learn from the example in Farmer Boy, is that good hard work, done through and for our vocation as husband and wife, is actually good for a marriage. And that an early bedtime can't hurt either!